My daughter's room is in shambles right now. One of my bigger projects planned this spring was to repaint and reorganize the kids rooms. I'm starting with hers since it'll be the less challenging one. She is insisting that there be some purple in her room since it's her favorite color of the moment. Her room was a sage green - greener one with more of a yellow tone. I love the open pallete green allows and decided to stick to it. 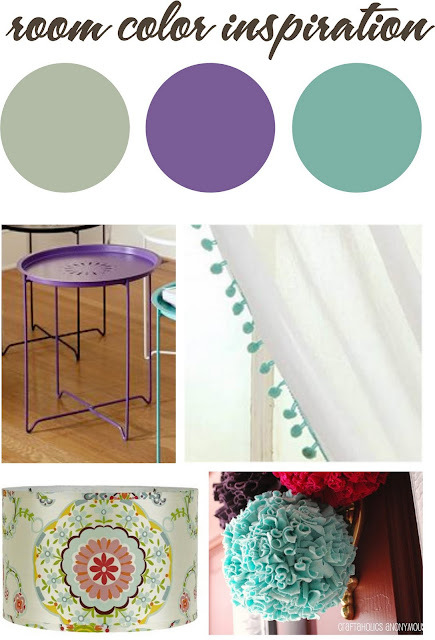 I choose a new version that is more of a green blue tone - Benjamin Moore salisbury green(first colored dot). The walls are all painted and I'm ready to move on. I've slowly been gathering some inspiration throughout a few sites. We have already purchased this adorable table from PBteen. It's on sale too! I'm inspired to make the pom pom curtains which I believe the ones I listed were from Anthropolgy. The lamp shade is from Shades of Light. I'm in love with it but, it's priced too steep. I'm hoping to find one with a similar look. We have a small dresser that needs a facelift and a few other things I need to get going on to see this room complete. I'll share some of the progress and the finished look when it's completed. Can you guess what I'll be working on this weekend? Did you know that you can shorten your urls with AdFly and make cash for every visit to your shortened links.